Improper relationship between sprocket speed and chain pitch may result in destructive action to the chain and sprockets, and may cause belt pulsations. In general, a higher sprocket speed is permissible with a short pitch chain. When high sprocket speed is used with a long pitch chain, noise as well as severe wear occur, resulting from the impact between the chain link and sprocket as the roller seats itself. A larger number of sprocket teeth will reduce noise, chain wear and pulsations. For maintenance cost reduction, roller chain sprockets should have an odd number of teeth, allowing the chain to change its bearing on the sprocket with each revolution, resulting in increased sprocket life. It is possible to run extended pitch chain on standard chain sprockets provided that they have at least 24 or more teeth. For example a C-2060 chain can run on # RC-60 chain sprockets provided it meets the above requirements. All of the sprockets in the drive end of the conveyor should be keyed to the shaft. However, it is best if the tail sprockets are bushed. This will eliminate excessive wear resulting from disparities in chain pitch and length or conveyor misalignment. Collars on the shafts are required to restrict lateral movement of the tail sprockets. 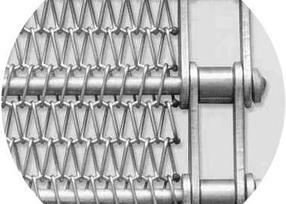 When chain driven belts turn around sprockets, it is usually necessary to use support drums, bushed on the shft and not keyed. These drums are used to prevent fabric and cross support members from bowing as the belt goes around the sprockets. Our engineering department can you help you with the design of your conveyor belt and sprockets.